After 25 years, Horizon outgrew their 216,436 square-foot facility in Avon, Mass. It was time for an office expansion. So the company decided to move to a new location that had access to major road networks, included a warehouse and distribution facility, and could house an energized staff. Horizon found just that space — a former General Motors warehouse and distribution center — in Norton, Mass. They hired BKA Architects to buck the current trend of “right sizing” the space, opting instead to expand and renovate the building to last for decades to come. 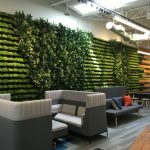 Between the 484,000 square-foot warehouse and the 55,000 square-foot office for staff, the renovations added 100,000 square feet overall to Horizon’s operation. So Horizon’s current operations in the new facility use only a part of the total space. But the potential is great: The warehouse is able to increase its distribution capacity from 60,000 cases to 80,000 cases per day, and the office space stands ready to grow by 20 percent. Executive offices and conference areas line the perimeter of the building. Clerestory windows and laminated glass walls throughout the interior allow for light to penetrate the interior spaces. The laminated glass has the added benefit of aiding in noise control. The layout of the first floor takes into account the operational flow of the business as well as the space requirements for the staff. The sales lobby and meeting rooms are located off the main entrance. Four of the large meeting rooms range in size from 48 to 80 seats. Sales operations moved into a large, open area featuring casual seating and a cocktail preparation area for vendors to use. The second floor houses open office areas with re-configurable workstations. Comfortable seating options are available to facilitate more casual discussions. When needed, the visiting sales staff may use the private, touch-down workstations provided in an open office area located nearby. Additionally, they have access to the in-house graphic production and design department to pick-up posters and sales literature. Horizon and BKA strategically placed card-access doors at strategic transition points, based on operational flow within the facility. These doors provide security without causing significant disruption to operations. The construction and renovations consisted of four phases. The first phase, core and shell, focused on the construction of the warehouse and office additions. Phases two and three focused on installing a fully automated material handling system, and bringing shipping and receiving into the warehouse. After phase three, the warehouse was fully operational. 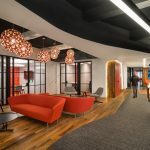 The final phase renovated the existing office spaces — along with the fit-up — within the two-story office addition, which added new office space. Old facility: 216,436 sq. ft.
New facility: 660,719 sq. ft.